10-Year-Old Rush Revere Reader Aces Constitution 101! RUSH: We have a 10-year-old on the phone here from Blue Ridge, Georgia. This is Hannan — and welcome, Hannan — 10 years old. I hope you can hear me okay. CALLER: I can hear you perfectly. How you doin’ today? RUSH: I couldn’t be better now that you’ve called. CALLER: (giggles) I’m calling about two things. I’m calling about Hillsdale and your books. RUSH: Hillsdale College? You are 10 years old and you’re calling about Hillsdale College? CALLER: Yes. So last October, I heard that you were advertising for Hillsdale, and my grandfather told me about it. So I went ahead and joined them, and in December, well, they quizzed me on it, and I passed. And then in January, I got the certificate signed by the president of Hillsdale. RUSH: Which course did you take? They have a bunch of online courses they offer. Which subject? RUSH: You took Constitution 101 and you passed the quiz? RUSH: We’re talking to a 10-year-old here, folks, from Blue Ridge, Georgia. That’s amazing, Hannan! RUSH: Did Hillsdale people know that you’re 10 years old when you took this? Do they have any idea? CALLER: No. They don’t know my age. They didn’t ask me when I signed up. RUSH: Yeah, that would have been discrimination. RUSH: They’ll hear about it now, I guarantee you. You know what? If a 10-year-old passed the course, they’re gonna tell themselves it may be too easy. RUSH: Actually, I don’t think that’s the case. I think you’re really advanced. CALLER: Yes. I am. At school, I’m in advanced classes, and so is my sister. RUSH: I love how you proudly say that too. Congratulations. RUSH: Your sister is, too, huh? CALLER: She’s 8 years old and in third grade. RUSH: I’m talking to a 10-year-old, folks. You said something about my books, Hannan? CALLER: Correct! I have been reading them. My grandfather a few years back bought two of your books, Rush Revere and the Brave Pilgrims, and Rush Revere and the Star-Spangled Banner. RUSH: And you’ve read them both, you say? CALLER: I read Star-Spangled Banner. I am currently almost done with Brave Pilgrims. RUSH: Okay. Well, I’ll tell you what. 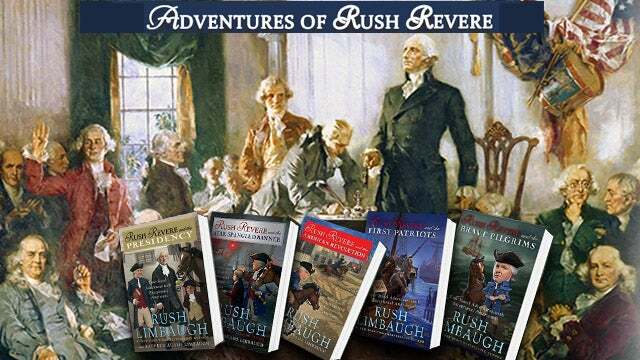 If you hang on here, we have a whole package of things that we send young people who like the Rush Revere Series from the Revere family, Liberty and all that. So, if you hang on we’ll get an address. If it’s okay with your parents, we’ll send you some stuff that will help you enjoy it even more. Hannan, I’m really glad that you called. Congratulations on acing Constitution 101, the Hillsdale course. That’s big! Everybody’s gotta be so proud of you.